Here are 16 really useful prepositions of place. 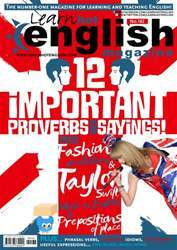 The latest issue of Hot English (162) is out now! Learn over 300 useful words and expressions and improve your listening skills with Learn Hot English! This month: 12 important proverbs and sayings that are common in conversation. Plus, 12 useful prepositions of place, negotiating words and expressions, 8 useful phrasal verbs for chatting about someone, 15 useful words and expressions to use when you visit someone’s house, 8 words and expressions for ending a phone call, 8 useful idioms... plus: •	Fashion – the things we hate! •	Travel – the benefits of student exchanges. •	Food – snacks to make you feel better. •	Grammar – the present perfect passive. •	Business – how to arrange a meeting. •	Social – catching up on the latest news. •	Cinema – movies for kids you won’t hate. •	Mystery – two spooky mysteries. •	Language – how to remember difficult words. •	Recipe – onion soup. •	Legal – ridiculous lawsuits. •	Psychology – how to get your revenge with a home. •	Music – Taylor Swift. •	Medicine – Google, or the doctor? •	Family – embarrassing parents. AND LOTS, LOTS MORE! By reading and listening to all this great content, you'll improve your English reading and listening skills and learn up to 300 useful words or expressions. Plus, you'll get a better job and pass English-language exams more easily. Guaranteed! THINGS WE HATE ABOUT FASHION! CAN A STUDENT EXCHANGE HELP YOU LEARN? 8 SNACKS TO MAKE YOU FEEL BETTER! 5 MOVIES FOR KIDS YOU WON’T HATE! HOW TO LEARN DIFFICULT WORDS IN ENGLISH! HOW ENGLISH UNLOCKED CAN HELP YOU LEARN ENGLISH! 12 iMPORTANT PROVERBS AND SAYiNGS! HOW TO GET YOUR REVENGE... WITH A HOME! HOW MUCH DO YOU KNOW ABOUT THESE FAMOUS LANDMARKS? WHICH FAMOUS PEOPLE WOULD YOU LIKE TO MEET? IS THIS WHAT WE CALL JUSTICE?